In my work as the RCIA coordinator at my parish, I get to meet a lot of people who are coming back to a practice of faith after a long time away. Many of these people are Catholics who were baptized as children but then, for any number of reasons, never finished their other sacraments of initiation. Some are members of other denominations or even other religious faiths who had a practice of prayer or spirituality that was eventually abandoned. In all cases, whatever the reason for the cessation of practice, the fire in their hearts for a relationship with God was never fully extinguished and they are now actively seeking to kindle that relationship once again. In all of these people I see a spark of excitement. Something in their life has shifted and now, now is the time when they are taking the step to reach out to a community. When they talk about what brought them to my office, why precisely today is the day they decided to come join the parish or join the Church, there is always a light and heat in their voice that is electrifying. However, all too often, I will see that light dim as they talk about how ashamed or sad they are for having been away for so long. They’ll share some hurtful or harmful thing that they did or that was done to them; that made them walk away from faith. We were raised Catholic, but then my parents got divorced and we just never went after that. My parents were Catholic, but I had an awful relationship with them and didn’t want anything to do with their faith. I was really involved in a parish, but then I had a big falling out with the pastor and just couldn’t bring myself to be involved any more. In high school I was deeply involved in the Church, but the life I led in college didn’t really match Catholic teachings. I felt like a hypocrite, and just stopped attending Mass. My husband died and my church didn’t do anything to support me — I couldn’t really forgive God or them for making me go through that alone. Many are angry — some at others, but just as many at themselves. Some are ashamed. More often than not, there is a real sorrow over the choice to walk away. Even if they were in some way a victim, most of them feel the need to apologize for their absence. This regret often takes the form of a personal apology to me, the representative of the Church with them in that moment. When people apologize to me for their absence from faith, from prayer, I always feel a bit awkward responding. As a single and very flawed minister I do not speak for the whole Church, not even my whole parish, and much less for God Almighty. But in this moment, to this person, I do represent the Church and what I say next may very well make or break their decision to continue on this path. The good news is that I do think I have an inkling of what God might want to express, and it’s what I always try to share with the individual across my desk. I am so glad you called. People who have been actively practicing faith for a while can forget how intimidating returning to the Church can be. Even if someone has already decided that the Church is something they want to be a part of — something of beauty they want to return to — there is often some very real fear and trembling. All too often, Christians are seen as stern moralizers who care more about naming and categorizing sin than caring for the human hearts wounded by it, and too many people come back to the faith expecting a lecture. We need to overturn this image with a better one, the image that the Gospel maps out for us — for we have been given a blueprint of response when one of our brethren makes their way back home; do not fall into the sin of the older brother, clucking your tongue in judgement when you should celebrate at the feast. If you are a Christian, do not forget your duty to hospitality (and perhaps consider sharing this blog with someone who might feel conflicted about returning to the Church). And so I say to everyone who is thinking of returning to the Church — to those who have been disaffected, betrayed, hypocritical, distracted, skeptical or hedonistic — Come home! Reach out! We miss you! Who you were yesterday is of no concern — today is what matters. Come back; you will not be met with judgement or hostility. And if you are, if you sadly happen to come across a rare minister who does not speak words of welcome to you, then call another parish. I guarantee you will not have to walk far down the road of return before you meet a brother or sister who will respond with the joy and celebration that God surely feels at your return home. In one case, I remember sitting in the shade on a hot day with a group of girls at Bible camp and our counselor offering a puzzle: I am going on picnic and bringing cookies and my glasses. What are you bringing? Can I bring chips? No, no chips on this picnic … The puzzle would continue all week until all of us in the group figured out that it wasn’t about objects or colors or any other typical category that defined what we could bring: we could only bring words that had double letters. Now, decades later, I understand that playing such a game at Bible camp was not just a time-filler, not just a way to keep a bunch of girls out trouble. Rather, such puzzles were brilliant opportunities to introduce me and my peers to one of the most challenging aspects of Christian discipleship: following Jesus’ demands that we think differently. “We Christians know that somehow or other, we are called to “think outside the box” regarding the problems that confront society and the world, but we don’t always know exactly what the box is or how to go about thinking outside it.” ~ Linda L. Clader, Voicing the Vision. Here’s a bit about the boxes that get in the way of following Christ. In the Kingdom of God there are no enemies because we’ve loved them all into our friends. Death and division don’t have to have the last word. We don’t have to pick a political party, wear the latest fashion or obsess over petty things. We don’t have to choose a side or declare right or wrong. In the Kingdom of God we get to be compassionate, nonjudgmental folks and rebel against the crowds of judgmental people by loving everyone. We get to listen and love and see the good in everyone, no matter who they are or what they have done. We don’t have to fight back or run away when oppression or violence comes toward us; rather, we get to stand up for justice and peace with creativity and compassion. To be free of these boxes means that we can let go of anything that blocks our imaginations from dreaming up a world where all human dignity is honored and protected, where peace and justice are abundant for every creature, where heaven is known and experienced in this world. To be free of these boxes means that nothing can contain the ways we work for Christ. There are no limits to how we offer mercy, kindness, forgiveness and love. There are no expectations either, for when we allow God’s power to work through us, we can be surprised again and again by what wonders can occur, how goodness can be triumphant. May the Spirit of God help us escape the box of either/or and give us the grace we need to be active in the energy of both/and—all in the space where we see that every person (Yes, even that person!) is a sinner and a saint, where all of us are works in progress in need of God’s grace. Then we shall be freed from the limits of our human understanding and imagination. Then we can follow the ways of Christ’s love and can live in joyful awe of God’s work in the world! 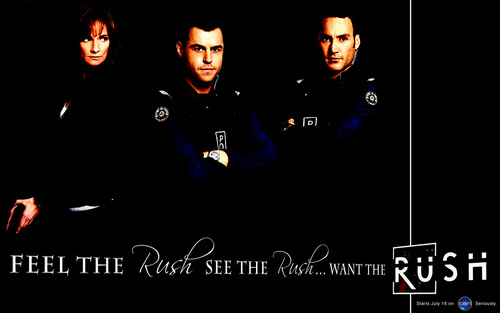 I have started watching an Australian cop show, a drama called Rush, in which the main focus is on de-escalation. The officers are gifted at negotiation and always use the least force possible. They use Tasers and beanbag guns instead of real pistols. If the team of officers is chasing a car with teenagers in it, they tell everyone to back off and follow slowly to reduce the potential for an accident. Hands are clasped with simple plastic tags, and tear gas is used to diffuse a violent situation quietly without hurting anyone. I feel like I have a plank in my own eye. Why are these story lines so surprising to me? They treat officers as human beings, with reasonable reactions and emotions. They portray violence and death as real tragedies to be avoided at all cost; not as fodder for another night’s titillating entertainment. What amazes me most is simply seeing a portrayal of police officers who take every measure to limit the use of force, and are saddened profoundly by any act of violence. This is not what I see in American media or even on the nightly news. Violence is gory, graphic, and glorified. The body count and the emotional aftermath are passed over quickly in the rush towards a climactic finish of utter destruction. The shows we watch, the games we play, and the streets of our home towns are increasingly violent. Recent events emphasize our militarized police force, the very real threat of terrorists, and armed conflict on a global scale. This violent reality is what we see every day—our center, the very ground we stand on. The person in Jesus’ parable does not see the plank in her own eye. I wonder if it gets harder to see with a log in your eye, or if you just get so accustomed to the view that the whole world just has a plank-sized hole in it. Watching this Australian show is like seeing the world from a less militarized, more emotional perspective. Jesus instructs us, First take the plank out of your own eye, and then you will see clearly to remove the speck from your brother’s eye – Matthew 7:5. Does he set before us an impossible task? Can we really remove the plank, or is the whole point of the story just a reminder to be more compassionate and merciful about the speck in our neighbor’s eye? A theology professor pointed out to me that when we are looking at the world we can never clearly see or name the land we are standing on. Is it possible to ever see where we really stand, to recognize how our own personal blindness and cultural biases shape our perspective on everything? I have a confession to make. I’ve noticed something about myself while I have been bopping around Chicago the past few days. Here goes: I tend to be really judgmental. There, you have it. What an ugly admission. Let me explain. As I walk down streets, go through crowds and sit at train stations, I try not to ignore people. Basically, I do a lot of people watching. As I watch people, I try to be open to whatever interaction I may have with them. I play a little game as I people watch. That’s where the judgmentalism comes in. I guess what categories people fall into and what their life might be like. I imagine stories about the characters I encounter based on a few clues: what they are wearing, what’s in their hands, and their body shape. I am totally jumping to conclusions and trying to read a book by its cover! This all happens exclusively in my mind, simply for entertainment or as a distraction from the studying I ought to be focusing on. It’s like I have a habit of playing a little traveling game, meeting people and then making up stories. I am just not sure that it’s a good habit. I hope it’s not mean or un-loving. But, still, I realize it’s judgmental. I know I am not unusual for noticing things about the people I meet and making guesses about them. I am pretty sure I am not strange for categorizing people and things. The thing is, I am learning that it’s not necessarily helpful or holy to categorize people into different types of groups. I’ll admit it. I frequently oversimplify my intake of the world and people around me because of my bad habit of categorizing. In order to inspire appreciation of how our Christian lives need to “capture a wide variety of colors, textures and hue … that really does promote the flourishing of all people and give God praise” I have created a little photo mediation. Enjoy!